Spacious Ranch Cottage with private hot tub and VIEW! 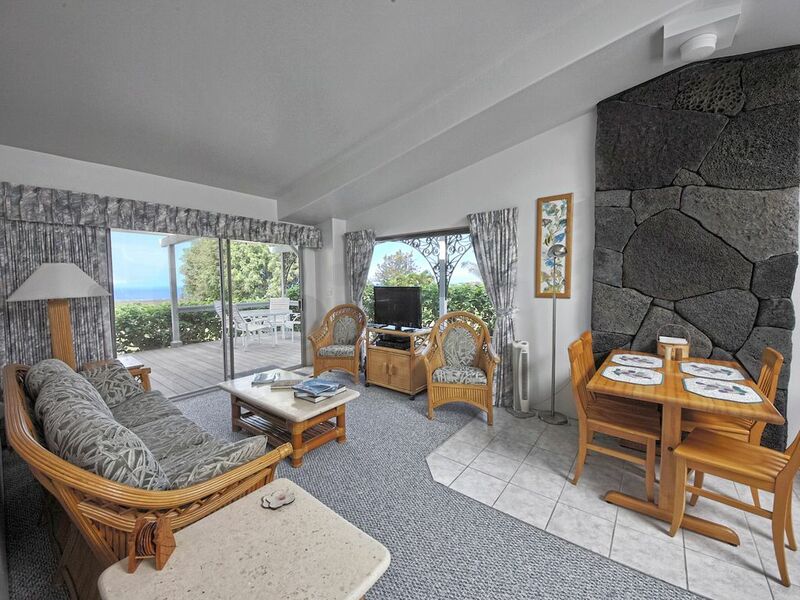 Our Ranch House Cottage sits above the town of Kona with beautiful views of the Kona Coast. We are a 10-acre gated estate. This unit has a private Hot Tub/Jacuzzi with magnificent views. We a working farm with miniature goats and chickens. Fresh fruit and fresh eggs provided when available. Sit on your private porch with porch swing and take in the views, enjoy the farm and friendly goats and chickens or come enjoy the sunset by the pool! We grow bananas, pineapples, and mangos. Silver Oaks Ranch is a 10-acre gated estate with 40 Mile coast line views of the Kona Coast. We are a 10 minute drive to downtown Kona in one direction and 10 minutes to the Keahole-Kona Airport at a cool 1400 foot elevation. We fell in love with this property back in the mid to late 90's and hoped to retire here some day. So here we are! We enjoy Hawaii and the beautiful weather all year round. We have a pool overlooking the view, and private hot tub / Jacuzzi for the Ranch House Cottage. As promised. So comfortable and relaxing. Rick and Amy are amazing hosts. Beautiful views . The pre arrival instructions were clear and easy to follow. The guest cottage is appointed for comfort. Everything we needed was available for our visit. The laundry facilities were always clean and well stocked. The kitchen has everything we needed to prepare quick or elaborate meals depending on our mood. The location of the Ranch is ideal for getting around. High enough on the hill to have georgeous views of the coast and incredible sunsets but not so high that it was in the rain band. The hot tub was so relaxing at the end of the day! Rick’s photographs of the island are amazing.! The knowledge he and Amy have of where to go and things to see was condensed into one binder that was so useful. We enjoyed the other Hawaii guides but for a succinct explanation the binder could not be beat! Their opinion of places to eat and things to see was right on. We loved our Big Island stay. A place full of 'Ho'okipa' (Hawaiian hospitality). 'The tradition of welcoming guests and travelers with food and water is a literal description of ho’okipa.' The owners, Rick and Amy, were a full of Hawaiian hospitality and made us feel like we were special guests. My wife and I stayed at the Ranch Cottage for six nights and we loved it. The place was well stocked with kitchen & bath supplies, beach towels, beach chairs, snorkeling gears, mats, and coolers. There is a hot tub on the lanai. We gazed at the stars every night while soaking in the tub. The night sky was dark and the stars were so bright; and since The Big Island houses Mauna Kea Observatories, the faint streetlights we saw far away in the distance are more astronomer friendly. Thank you two for the nice review! Hope we have the chance to see you again in the future. Mahalo for your stay with us!